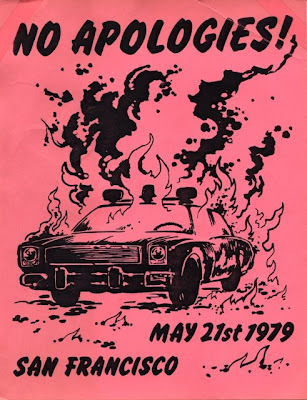 In May, Maggie Jochild wrote an astonishing piece which I reviewed, The White Night Riot, 21 May 1979, and Lesbians Against Police Violence. That piece has now been picked up by OpEdNews as Milk and the White Night Riots. Two weeks from now a long-awaited movie on gay-rights icon Harvey Milk is being released. Maggie will review the movie around when it's released. In short, how do you tell a movie about a historical time and figure such as Milk and the Riot, when many of the principles are still alive and have strong opinions and memories about the events? Till then make sure you've read Maggie's piece. And check out the OpEdNews article as well. They did a fantastic job weaving in Harvey Milk and other viewpoints. The White Night Riot is one of the key turning points in the history of LGBT rights. Maggie was one of the women leading the march. Two weeks till the movie.